Boston, MA - Boston Bruins General Manager Peter Chiarelli announced today that the team has acquired forward Matt Marquardt from the Columbus Blue Jackets in exchange for defenseman Jonathan Sigalet. In his two-plus seasons with Moncton from 2005-2007, the 6'3'' 222-pound winger appeared in 170 regular season contests, tallying 77 goals and 51 assists for 128 points. 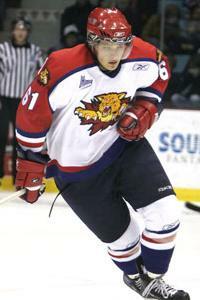 He had 41 goals and a career best 29 assists for the Wildcats during their 2006-2007 campaign. Marquardt was originally selected by the Blue Jackets in the seventh round, 194th overall, in the 2006 NHL Entry Draft but had not signed with Columbus. Sigalet saw action in 74 regular season games for the Providence Bruins (American Hockey League) in 2007-2008 and notched 3 goals, 20 assists and a +20 plus/minus rating. In three seasons with Providence, he appeared in 199 regular season games, registering 81 points on 21 goals and 60 assists. Sigalet's only NHL appearance came on January 9, 2007 with Boston in a game at Ottawa. He was drafted by the Bruins in the fourth round, 100th overall, in the 2005 NHL Entry Draft.